Published: Aug 21, 2017 to ? The comedy spin-off story focuses on the Spear Hero, Motoyasu Kitamura. At the brink of death he acquires the power to turn back time, and decides that he'll use it to become stronger and start a "new game." This manga is a spin-off of the parent story Tate no Yuusha no Nariagari, focusing instead on the adventures of the spear hero which occurs at some point in the main story. As such, this story to a certain extent requires some prior knowledge on the parent story otherwise it could be a confusing mess. Whilst the manga does try to explain things to the reader in case they have never read the parent story, the experience fall short without prior knowledge. As this is a spin-off of a future event in the parent story (Or at least it's in the Webnovel version of the parent story; and since the Light Novel version and Webnovel version diverge from the Cal Mira island arc I do not know how this Spin-off will fit in), it may potentially spoil some events of the parent story. Whilst the effect is minor, it may be better to read this manga after finishing the parent story. The story of this spin-off itself isn't spectacular. It follows the spear hero Motoyasu Kitamura, who has gained the ability to turn back time with a special spear and returns to the beginning of their adventure. Him, knowing the future events takes action to change the future. However, due to the events of the events of the parent story Motoyasu has become a broken man, slightly psychologically unstable in a sense, something this manga doesn't portray well enough. As such, his memories are a little messed up (also due to the time travelling, as shown in the manga). As a result he doesn't take the best course of action or find solutions to problems using wisdom and knowledge of the future like other time-travelling/new game/restart stories like Re:Zero, All You Need Is Kill, Steins;Gate etc. Instead he acts very spontaneously like a madman, which may annoy many readers. In the Webnovel, him acting like a madman was actually fun to see to a certain extent, something this manga failed to replicate. Motoyasu also kept his abilities from the future, making him stronger than most people in this manga. However the way the manga shows his power is not satisfying enough. Though understandably, Motoyasu does not care about his powers at this point due to him becoming mad. As you read the manga you start to understand more about the conditions and the situation he is in, such as why he is back in time, the conditions of the reset etc. The art is alright, but not better than the parent story. As for character development there is next to none and would require the reader to already have sufficient knowledge on the characters (The manga only explains the bare minimum about these characters). Whilst not an exceptional spin-off it is still something fans of the original series would enjoy. Do not read this manga/novel unless you are towards the very end of the original Shield Hero web novel (manga is very far behind)! 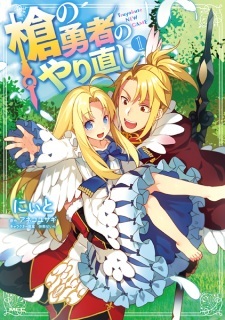 With that said, this follows the story of Motoyasu, and is completely different from the original Shield Hero web novel as it is much more comedic and lighthearted. I considered it very enjoyable and read it after I finished the original manga. You can just laugh at the absurdity and stupidity of Motoyasu's actions. It especially amused me how others in the story reacted to Motoyasu. As for the story itself, it offers some interesting lore and information we otherwise did not get in the original, but it does not offer much as far as substance is concerned. We learn more about Motoyasu's state of mind after some of those events in Shield Hero and see how he handles things "differently," in order to fulfill his obsessions. It is a simple comedy spin-off. Basically, read if you want more Shield Hero and you would be pleased with following a comedic adventure with Motoyasu doing dumb things.